Fraker Fire Protection Inc. provides testing, repairs and installation of fire alarm systems for private, commercial, residential or industrial facilities. We are your “One Stop” source for fire alarm systems in Los Angeles County, Ventura County,Orange County and the Inland Empire. Not only is Fraker Fire Protection Inc. a full service testing, repair and installation company but we also comply with all state and local Fire Department requirements. The State Fire Marshal Law requires that all fire alarm systems be serviced regularly. Our team of fire alarm system technicians are licensed and experienced professionals who inspect and service fire alarm systems according to the needs of your business or private facility. Fire alarms are one of the most vital fire protection systems anyone can have. They detect and send either audible or visible signals in the event of a fire by monitoring changes in the environment or manual activation. he National Fire Protection Association (NFPA) requires that all fire alarm systems be tested at least once a year and local fire codes may require more frequent testing. Due to the strict fire alarm regulations in California, all our systems are listed and approved by U.L. Laboratories and the California State Fire Marshal. We ensure that all technicians who install fire alarm systems are certified or actively hold C-10 licenses. Our testing, repairing and installation of fire alarm systems complies with the California Administrative Code Title 24 State Building Standards, Title 19 State Fire Marshal Regulations and Los Angeles City Fire Department Regulation 4 code requirements. NFPA requires that all premises meet all fire alarm requirements and should be monitored by a central station facility if required. We ensure that your fire alarm system complies with NFPA 72 in that it sends a signal for any closed condition of any of the sprinkler valves as well as general trouble and alarm signals from the main fire alarm panel once it is installed. 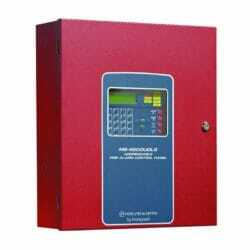 According to the fire alarm standards, we also ensure that the monitoring panel is protected by a smoke detector. A manual pull station is included in case there is no local fire control panel. Response time is very important in the event of a fire emergency. Fraker Fire Protection Inc. offers standard as well as emergency services to inspect and repair fire alarm systems promptly. Fraker Fire Protection Inc. has a reputation of offering reliable and quality service for fire alarm systems Los Angeles and Southern California. Our professional technicians are knowledgeable in their field and ensure that all our customers have a fire alarm system that functions properly and according to regulations. Fires are major problems for anyone at any time. It is important to control a fire as soon as it begins. By having a workable fire detection system, you are insuring protection and safety from an outbreak.